No, not the game on the field. With all due props to Tom Brady and crew, it’s the advertising Super Bowl that matters — at least, to the companies that spent millions on those coveted ad spots. Eleven auto brands ran ads during (or immediately before) Sunday night’s NBC broadcast of Super Bowl XLIX. Each cost millions of dollars to run — and in some cases, millions more to produce. Which generated the best results? Which Advertisers Got the Biggest Results? There are lots of ways to measure a TV ad’s effectiveness. When it comes to car ads, one useful metric is this: How much immediate interest did the ad create in the car it advertised? Lexus ran ads for two models during the game. In the second quarter, a spot called “Make Some Noise” featured the NX 200t crossover, and another called “Let’s Play” ran in the third quarter and showed the RC 350 sports coupe sliding around like a radio-controlled toy car. Those ads together gave Lexus a 37 percent increase in interest during the Super Bowl, Edmunds said, tops among automakers, and Kelley Blue Book said that the “Let’s Play” spot was the most effective car ad of the night. 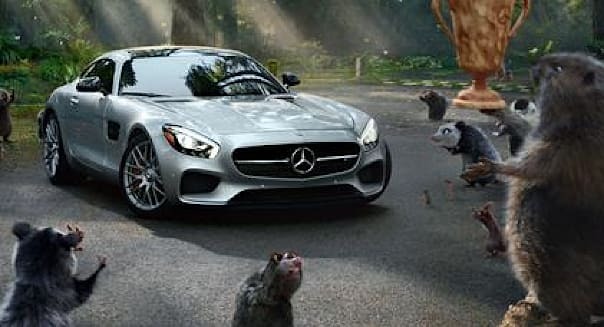 Mercedes-Benz scored big with a lighthearted 60-second retelling of the tortoise-and-hare tale, in which the tortoise gets into a Mercedes AMG GT S sports car to help out his cause. Edmunds said that the ad drove a 36 percent increase in interest in Mercedes, second overall behind Lexus — and a 2,189 percent increase in inquiries about the AMG GT S model. It may seem a little odd to run a Super Bowl ad with mass-market appeal for a sports car that starts at $129,900. But in part, it’s about building the Mercedes-Benz brand as much as it is about selling the AMG GT S itself — and it’s also about reaching all at once the small group of affluent buyers who might be interested in the model. BMW saw good results with a well-executed ad featuring former “Today Show” co-hosts Katie Couric and Bryant Gumbel in an electric BMW i3. Edmunds.com tracked a 583 percent increase in interest for the i3 and a 16 percent overall boost for the BMW brand, while Kelley Blue Book saw a 1,131 percent surge in interest for the model. Also worthy of mention: Super Bowl regular Fiat Chrysler (FCAU) scored a 52 percent surge of interest in Edmunds.com’s metrics for its Fiat brand with a cheeky ad in which a bouncing blue pill transforms a Fiat 500 into the larger 500X model. And its Jeep brand saw interest increase 43 percent on Kelley Blue Book with a third-quarter spot featuring its new Renegade model. But Do These Ads Really Have Much of an Effect on Buyers? They can. A year ago, Fiat Chrysler’s tiny Maserati brand ran a Super Bowl adfor its then-new Ghibli sedan. The ad kicked off a surge of interest that helped Maserati more than double its U.S. sales in 2014 — a good precedent for Mercedes and its AMG GT S.
And in 2011, Chrysler’s powerful two-minute “Imported from Detroit” ad featuring rapper Eminem did a lot to put the scrappy Detroit brand back on Americans’ mental radar — and their shopping lists. However, it may be a few months before we know which — if any — of 2015’s ads will join them in driving big traffic to an automaker’s showrooms.